The gallery will be closed between the 28th of February and the 5h of March 2019. The gallery will be closed between the 24nd of December 2019 and the 6th of January 2020. We kindly ask for your consideration. You will find us in the Cologne City-Center, approximately 3 minutes walking distance from the main train station, as well as from the cathedral. We are located near Wallraf-Platz, across the WDR and the Museum für Angewandte Kunst, and between Nord-Süd-Fahrt, An der Rechtschule and Drususgasse streets. 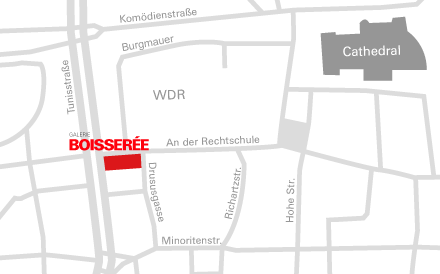 Parking is available directly across the gallery and all around the Museum für Angewandte Kunst, as well as in the three nearby parking garages located by the cathedral, next to the opera house, or on Brückenstraße (see map).